You might have heard about or come across travelers who love to travel and book their amazon tours from Quito through travel agents. Travel lovers, Eleni and Christos are not one among them! Adventure lovers, Eleni and Christos always plan a journey to the unexplored land on their own by researching a little about their travel destination. This is because they always love raw adventure. They don’t want to go through a path travelled by others. During these travels, they face tough difficulties such as visa process, travel, accommodation, changing weather, and more. In early October 2016, the Thessaloniki couple Eleni & Christo, took a flight from Quito, the capital of Ecuador to Coca, a small city at the confluence of three rivers. There, they were transferred to the jetty of Napo River and continued with a motorboat. After two hours of sailing, they arrived at the nearest part of the river and the Lodge. Eleni and Christos booked a cabin at Sacha Lodge, where they were welcomed with fresh lemonade and some information about their stay and other activities. 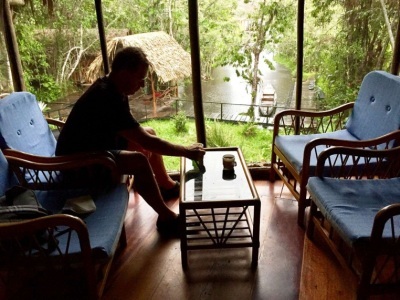 At Sacha Lodge, they had their first taste of a tropical storm while walking to their cabin. Early afternoon, they started a canoe trip into the deep forest. During this trip, they witnessed Cappuccino Monkeys jumping above their heads. They share more sweet and fun travel experience and tips about this area having recorded eight species of monkeys, 50 species of bats and more than 500 species of birds which they have narrated in their travel blog MyTravellingDays. “Just before 6pm, we started back for the Lodge. The night was falling fast. At some point, we found ourselves in an absolute darkness, under the dense foliage of trees, while our only company were the sounds of the jungle, the paddling and the water. Until we finally reached the lake, where we witnessed a truly magical sunset scenery,” Christos says sharing his travel experience. Eleni and Christos took advantage of the fresh early morning hours on October 6, to start their adventure through the deep forest again. They climbed up to the Canopy Walk, a 275mt long bridge, one of only a few rigid, self-standing, suspension canopy walkways in the world, above the forest floor. Lovers of nature, Eleni and Christos watched ants, frogs, caterpillars, termite nests, monkeys, butterflies, birds, orchids and also palm trees in more colors than one could ever imagine. They also had a chance to visit the native group of Kichua, of the Providencia Community in Yasuní, one of the 250 native groups, who live in the Amazon Rainforest. Eleni and Christos had a brief talk with them and learned about their culture. During the morning of their last day in Amazonia, they returned to Coca through the Napier River. Visit http://www.mytravellingdays.com/ to know more about their world travel experience. The author is a travel blogger who shares inspiring world travel experience stories. In this article, she explains how the Thessaloniki couple Eleni and Christos handled their trip around the world single-handedly. Visit http://www.mytravellingdays.com/en/welcome/ for more information.